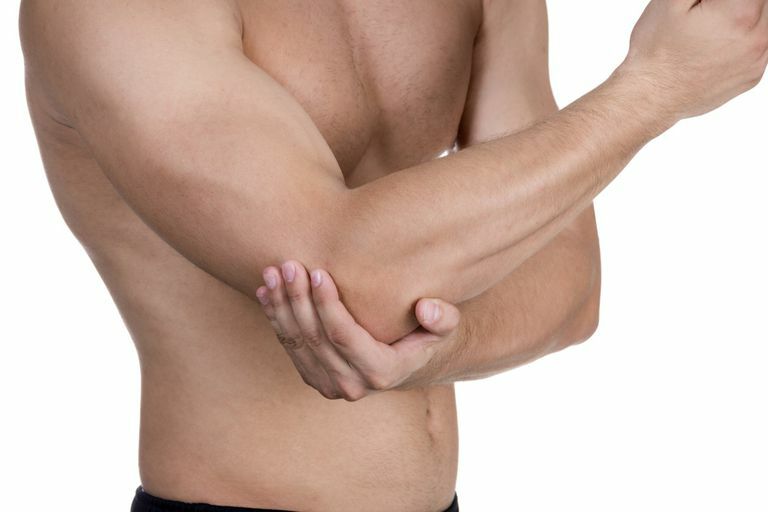 If you have an injury to your upper extremity or elbow, you may benefit from the skilled services of a physical therapist to help you regain normal range of motion (ROM) and strength of your arm. Elbow strengthening exercises may be an important component of your elbow injury rehab. The bicep and tricep muscles are the large muscle groups that bend and straighten the elbow. The biceps are located on the front of the upper arm and the triceps are located on the back. As noted by the name, two muscles form the biceps while three muscles form the triceps. The biceps is also responsible for turning your forearm over so your palm is ​facing up. Exercising these muscle groups not only increases arm strength but also helps everyone, especially older adults, perform activities of daily living. Strong arms help to lift up and out of a chair as well as pull on shoes and other clothing items. Here are some great elbow and arm strengthening exercises that your PT may prescribe for you to do. They are isometric exercises; no motion occurs at the elbow while you are contracting your muscles around the joint. Be sure to check in with your doctor or physical therapist before starting this, or any other, exercise program. This exercise works the triceps muscles located on the back of your upper arm. These muscles extend your arms and help you push things away from you. They are also muscles that are active when you are pushing yourself up from a chair with your arms. This may be especially important if you have a lower extremity injury or weakness that makes rising from a seated position difficult. This exercise strengthens the biceps muscles located in the front of your upper arm. They are active muscles when you are bending your elbow and when lifting items. Supination and pronation is the action of turning your hand over to have your palm up or palm down. This is a simple exercise to get your forearm and elbow pronators and supinators working. These exercises can be done several times per week to help improve muscular function around your elbows. You should stop if any exercise causes pain. Progression from these exercises to more challenging ones can be done by adding a resistance band to your workout or by using dumbbells while performing the exercises. If you have an elbow injury, your physical therapist can assess your condition and prescribe exercises to improve your elbow mobility and strength. These isometric strengthening exercises may be one component of a well-balanced therapeutic rehab program for your elbow. By working hard in PT and by being vigilant about doing your home exercise program for your elbows, you can get back to your normal functional mobility quickly and safely.